The big news from the July 26 Sound Transit Board meeting was that the Federal Way Link extension will cost about $460m more than originally planned. It may not be the last project to cost more than expected: at the meeting, CEO Peter Rogoff briefed the board about mounting challenges in delivering capital projects on time and on cost. Notably, agency-perceived expanded scope is one of the reasons First Hill station didn’t make it through the ongoing ST3 planning process, although cost-increasing alternatives in West Seattle and Ballard did advance. Meanwhile, the federal funding picture is completely opaque. The Trump administration, like most Republican administrations, is hostile to transit projects. Trump transportation officials are doing their best to kill off projects that were thought to have the go ahead. In Albuquerque, for example, local officials constructed a BRT line under the assumption that they had $75 million in Federal Transit Authority (FTA) funds on the way. As of July 18, the administration hadn’t ponied up. Rogoff is confident that ST will receive the federal funds that it needs. But, for whatever reason, Rogoff felt the need to visit Washington, D.C. just a few days before the board meeting to make sure ST was still in good position. Before taking the ST job, Rogoff was one of the most senior officials at FTA, so he undoubtedly knows how to read the relevant tea leaves. Yet it seems, based on his statement, that there is reason for concern. Rogoff also expressed concern that local tax revenues, particularly in the South King and Snohomish subareas, are lower than expected. Continued weak receipts could lengthen project delivery times. That, in turn, which would probably put further pressure on subarea equity, and shift funding away from Seattle and the Eastside to those areas. Snohomish County officials have already expressed their desire to siphon Seattle funds to build the Everett Link extension faster. Sluggish local revenues could increase that pressure, or fracture the Sound Transit political bargain. Without robust federal funding, which Sound Transit can move fairly easily from subarea to subarea, sustained revenue shortages would be hard to fill in. ST is already talking about financial engineering to accelerate the Everett line, presumably to head off the subarea equity fight. “Peter has consistently emphasized the agency’s full intention and commitment to build all voter-approved projects,” says ST spokesperson Geoff Patrick, “but the issue we have also consistently flagged is that our timelines are contingent on the necessary revenues. The scenario we want to avoid is one where the federal dollars we’ve reasonably assumed don’t come in and we have to backfill that funding at the local level. Only time can tell if ST will be able to stick to the cost estimates and schedule that it’s laid out for itself. We’ll know more about this issue when the agency releases its long range plan in the fall. ST3 shows an unassigned 10 percent contingency for projects. It’s too bad project costs are increasing. However, part of this problem appears to be caused by ST costing practice of low contingencies. It’s partly their fault. As a former senior FTA official, Rogoff himself should have be aware of this. Reducing contingency is a quick way to show that more can be promised on a referendum. Is that what ST did with ST3? There certainly has been a trend of rosy cost projections with our transit/transportation agencies lately. To me this reads like “this is the warning, we are going over budget”. But they’ll be in budget once they revise, so no need to worry about this. I agree. That’s how I read Rogoff’s statements as well. And, yup, Sound Transit will simply move the goal posts again. That’s been their m.o. for some time. If one wants further proof, simply read ST Board Resolution 2018-16 passed earlier this year that baselined the Lynnwood Link project. It’s a hoot! Has there been any discussion regarding pairing back projects (i.e. park and ride facilities)? The major funding shortfalls appear to be an opportunity to cancel wasteful spending on park and rides and convert them to a revenue opportunity via selling/leasing the land/air rights. It would really be a shame to build in wasteful land usage and undermine long term ridership based upon funding prioritization decisions made a decade ago, before our current housing boom and affordability crisis. If the original First Hill station can be canceled and an at grade alignment through the Rainier Valley can be justified for budgetary reasons. It is only fair park and ride facilities receive the same level of scrutiny, especially the egregiously expensive Kent P&R. Is it such a terrible thing that the west side Seattle line be truncated? Is getting a single surface station at 15th NW and Market in Ballard worth taking a century’s worth of a sub-optimal, design-restricted mid-level bridge instead of a tunnel? That single surface station will only allow an extension to the north and prohibit future construction of a Ballard-UW line. Nobody is going to put up with a four diamond surface crossing in the middle of the 15th and Market crossing so Ballard-UW would have to be elevated or tunneled, which means that the surface line could not serve as its connection to the Maintenance Facility. Better to run the Ballard area local collectors down to Dravus for the transfer until a tunnel under Salmon Bay can be afforded in order that an east-west line can be connected via tunnel. Similarly, the West Seattle spur as now designed is incompatible with either likely route for a future Burien extension. Ninety percent of the riders of West Seattle Link will be transferring to and from local distributor buses at one of the three (but probably just two in actuality) stations west of the Duwamish crossing. Why not just run the buses to a good quality transfer facility at SoDo and call it good until the District has the funds to build a tunnel that has a southerly heading at Alaska? Instead, ST should work with Seattle either to vacate Holgate and Lander between Fourth South and Sixth South or bridge over the busway/Link tracks and surface Royal Brougham at the Link crossing in order to run trains more frequently on the existing Central Link trackage. Connect that trackage to the new tunnel as planned but keep the connection to the DSTT and run Red Line trains down to the Maintenance Facility with a last stop at SoDo and use the loop to turn them and layover. A couple of trains per hour perhaps could continue on to the airport without undue impact on Martin Luther King Boulevard. Yes, the Everett extension is a giant boondoggle with its dogleg to a single station far from anywhere useful at Paine Field. But the political consensus on which Seattle depends to build the much-needed new tunnel will fall apart if strict subarea equity is enforced. I know; I know. Suburban voters insisted upon it in order that “Seattle” not “take our tax money”. But that was then and now is now, and they severely out-vote Seattle, even with its recent growth. Build for the future, Sound Transit, or don’t build at all. As a Ballardite, I was a supporter of Ballard to UW because of the problems going over (politcal) or under (cost) the ship canal. I have no issues with a high fixed bridge; but feared it would be watered down into Ballard Bridge 2 level height with a drawbridge. The Salmon Bay tunnel folks are led, IIRC, by a Ballard Chamber of Commerce person, the same folks who brought you the Missing Link delays. Much better to delay projects to collect the necessary revenues than lower the already low quality of these ST3 projects. People will be riding this thing for 100+ years – let’s not screw them over so we can have something 3 years faster. What are “the Missing Link delays”? Has somebody lost important Anthropological data? UW Station barely crosses the Ship Canal, and that creates a lot of hardship for people in northeast Seattle because of the gap between the station and the nearest urban village/transfer point. When Vancouver’s SkyTrain was first built, it initially only went to Scott Road, just barely over the Fraser. That required people from all over Surrey to get to the station, making the total trip time from downtown to Cloverdale an hour. Metro also used to do the same thing, where multiple routes would double up for 15-minute service just to 34th & Fremont ro Bellevue & Pine and then diverge, giving a tiny edge of north-ventral Seattle or Capitol Hill frequent service but being too far for 99% of it. In Dravus’ case it wouldn’t even cross the Ship Canal. So no, it would be useless for northwest Seattle. You’d have to take the D anyway to transfer to it. But there’s one way it might make sense. Downtown and SLU have a screaming need for high-capacity transit. A PSRC report concluded that downtown would run short of transit capacity if nothing was done as of 2014 (so before ST3). ST3 would not add more trains over ST2 if it weren’t for the Ballard line. So there could be value in building the downtown/SLU tunnel now and deferring the Ballard tail. In that case the tunnel would surface around Elliott & Mercer, so it could terminate at Dravus rather than just turning around at a non-station. On the West Seattle side there is no major need for transit capacity in SODO. Its only purpose is to get to West Seattle. On the other hand, if the northeast line is disconnected from the south line then it would have to terminate somewhere, and that could possibly be Stadium or Sodo instead of Intl Dist. Everett’s strategy is an inter-subarea loan, not a gift. ST’s interpretation of subarea equity is that it has to balance in the end. And its legal obligation is only to disclose how much of the subarea’s money benefits the subarea. However, if ST3 is terminated early and Everett is finished and Seattle is not, then it would be a de facto gift. Everett is also looking at raising money through public-private-partnerships, which would bypass the bonding ceiling. This sounds to me like a shot across the bow of neighborhood organizations who want changes to the alignment. It’s also true this situation, a plethora of financial unknowns, is nothing new and will most likely fix itself as time passes and engineering is completed. Someone needs to remind Snohomish County officials that Snohomish County is the primary beneficiary for the Everett extension, so if they want it faster they can pay for it themselves instead of making a play for King County money. As a new SnoCo resident, I would vote yes on an assessment to get Lynnwood and/or Everett Link done faster (and to improve local feeder bus service). The Everett extension is (by definition) the portion of Link north of Lynnwood (up to Lynnwood is ST2, and is managed separately, with the exception of N. 130th Street). King County subareas don’t pay a dime for the Everett extension. They get all the way to Everett when they do by formulating bonds and loans in such a way that they spend money as early as possible while not exceeding their debt limit at any point in time. As a result, I *think* this means that Snohomish County will pay ST3 taxes longer due to the fact that they are in the most debt. Point being, Snohomish County does pay for their portion, even if they pay at the same rate as everyone else. That’s true, but this is about SnoCo officials wanting it *faster*, which would require money from elsewhere, which is what people are snippy about. Al S., I hope you’re not saying that we can ever know in advance how much money we’ll need to have in a contingency fund to be sure that no project will ever find itself up against a setback it can’t cover with every penny still in the fund. Weren’t some serious miscalculations and malfeasance in our housing industry in both 2008 and 2018 – with the second looking to be the worse one. Which in about four years has blown thirty years’ land-use planning to rubble. In a disaster rolling like a seismic wave turning our every Interstate into an impound lot. Headed south toward a State line and north toward an international border. Labor and materials cost- ditto. But there’s a reason it’s called a business cycle. So while keeping our accounting honest and conservative- meaning careful, not reproduction preoccupied- I think transit’s best defense posture is flexibility. Constantly ready to change speed and direction as events dictate. Whether their tone is polite, or downright nasty. DSTT’s progress from dual-power to hybrid joint use to rail isn’t a blue-print, but a good example of a good approach. A subway progressing from buses to trains. Instead of decades of lines and dots.This year’s boring machines thirty years’ faster than the “Mighty Moles” of the late 1980’s. (Big Bertha was a WWI German cannon. Too bad it wasn’t the low bid.) Not grieving over First Hill- first ST-4 visit, I’ll still be too young for the geriatric ward at Swedish. If choice was mine, I’d pick leadership doing right as fast as possible. Not wrong as cheap as possible. Things done over please only The Seattle Times. But whoever’s project leader- and it had better be one person- if you can’t be honest with your voters and keep your job, get another job and leave them to become somebody else’s voters. Jut don’t expect your successor’s thanks for the gift-box. My parents house, they are not wealthy, are seeing their property taxes going up by $1000. Their MVET is going up a few hundred dollars as well. And now they are going to have to pay it longer or see them go up even higher still. This is just stupid on ST. Most of the property tax increase has been due to: 1) the State being ordered by the Court to catch up on education funding, which is NOT Sound Transit stuff!! !, and 2) rising property values. This is the fallacy of over dependence on property taxes–it is exactly the kind of thing that happens when you have the *most regressive tax structure in the country*. If it’s an income tax, by definition it *can’t* increase faster than your income. If it is sales tax, you could always buy less stuff. Gotta wonder what the plan is when the real estate correction hits…. Rising property values have relatively little to do with rising property taxes. It is only when the assessed valuation of a particular plat increases more rapidly than the average increase in assessed valuation in the taxing district that taxes on that plat increase faster than the aggregate limit. The main culprit this year is the double levy, but given the tenacity with which Civil Service employees hold to their jobs these days, most polities are forced to take the full allowable 1% each year to keep up with rising employment costs. The allowable rise beyond 1% due to increased population generally speaking is offset by the taxes raised from the new population, though not necessarily fully in every year in every taxing district. The plan is to truncate lines as ST did in the last recession. My property taxes went up about $1,800 compared to last year. Of that $1,800, $1,650 was the new state school levy; $65 was for King County; and $100 was for my local school district. Some other small changes (both positive and negative in value) made up the difference. My ST property taxes went down by $8.53. I paid ~$650 in car tabs recently, but I also bought a new car last year. If I had kept my previous 10-year old car, the difference would’ve been negligible. Your ST property taxes went down most likely because the agency ran up against the 1% per annum aggregate increase limit. Notice that your levy rate is not the full $.25 per thousand of assessed value. Sound Transit would need to put a ballot measure to the voters of the district to reinstate the full taxing authority, what is frequently referred to as a lid lift. The fire districts do this all the time, for example. My property taxes only went up by $700 this year. And of that increase, I’m estimating that $460 was due to an increase in house value (I used this year’s house value with last year’s levy rate). ST is as much a victim of higher land costs as we are. Also, I don’t see how someone’s MVET could increase unless someone buys a new car. I’m not aware of any new MVET levies this year, and by definition, cars get less valuable each year. Yes, and next year they’ll see their property taxes go down as the “double hit” of 2018 passes. I doubt you’re bright enough to understand this, but the legislature chose to “pre-load” its full support for K-12 education by levying the full taxes this year but not revoking the local levies they will replace until next year. 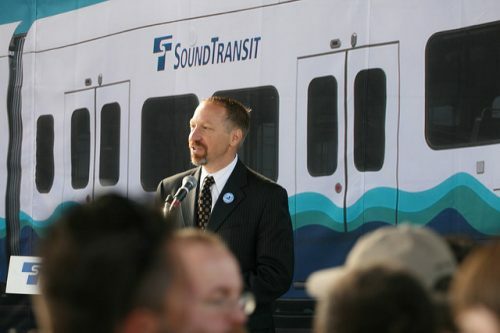 Blame the legislature, not Sound Transit. So far as your parents’ MVET, they must have a nice Merc — not Mercury, but Mercedes — for the difference in tax rate to be “a few hundred dollars”. Maybe a Porsche? Yeah, a Carrera. Cut the Boeing deviation, which will have extremely little usage outside Boeing commute hours, and replace it with a shuttle bus with during Boeing commute hours with very high frequency (like one bus per train, timed). This way you can also route the bus to go more directly where people are going. This bus won’t get stuck in I-5 traffic, but even if there is traffic problems, then pay for 2 miles of bus lanes and be done with it! This seems like a win-win solution, as the purpose Link fulfills best (escaping long freeway backups) is done by Link, and the purpose best fulfilled by a bus (a tailored commute solution that goes to many key destinations) is served by a transfer to a bus. Plus, it will get Everett a much coveted and only one of its kind direct and non circuitous route to Seattle, which matters when trains only go 50 miles per hour max, and everyone’s trips are slowed by high numbers of stops. I’m gonna disagree on this. I think the problem is that you’re thinking about this is in a present sense and not in a future sense. One thing to remember is that SnoCo has allowed for the building of an airport terminal at Paine Field. I expect that this will come up if it gets completed before they start planning the Everett extension and if it does then I expect we’ll see a master plan to make the airport larger than its current two or three gates. Well, yes, that would probably be true, if the terminal were going to have a station! Alas, it is not to be. The station is to be a Seaway, a long way from anywhere “transit center”. Not exactly. Let’s not forget ST pulled not one, but TWO full funding grant agreements out of the George W. Bush administration, totaling $1.3 Billion for the Rainier Valley and UW lines. Bush’s FTA administrators, Jenna Dorn and Jim Simpson, dutifully implemented the law, even in the face of ideological opposition from the Kemper Krew. It’s always worth noting when Trump’s extremism makes even W look like a statesman by contrast. I am going to do something I would not normally do here, quote the Bible. Luke 14: 28-30 KJV “For which of you, intending to build a tower, sitteth not down first, and countering the cost, whether he have sufficient to finish it? Lest happy, after he hath laid the foundation, and was not able to finish it, all that behold it begin to mock him. So the Dear and Glorious Physician was an economist too? Who knew? Bye bye park and rides. Bye bye 130 St Station. Bye bye BAR station. All three a good things. If it’s any comfort, the tariffs are impacting on time and within budget delivery of traffic lights and similar tiny projects in Portland. Well if the agency’s two decades’ long history is any indication of future performance, I seriously doubt that ST will be able to achieve either objective. The statements made by Rogoff and Patrick in regard to the ST’s committment to its financial planning made me laugh. One only has to look at the lengthy delays in publishing the agency’s annual financial plan for the last two years.